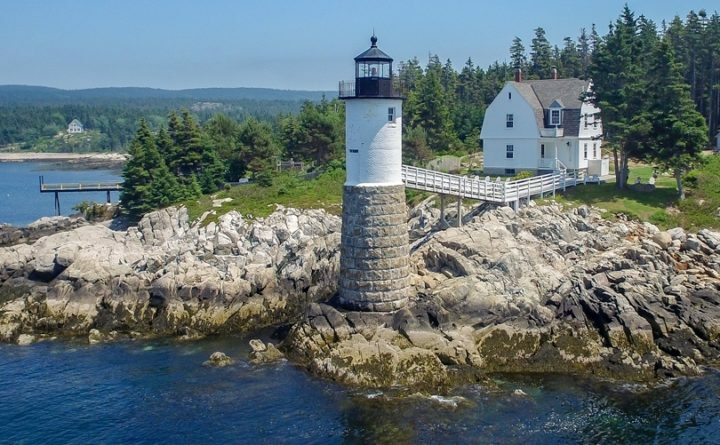 A former lightkeeper's house on the offshore Maine island of Isle Au Haut is on the market for $1.97 million, but the attached lighthouse is not for sale. A picturesque inn on Isle Au Haut that once served as a lightkeeper’s house is for sale for nearly $2 million, but there’s a catch that comes with it. The inn property does not come with the lighthouse that sits directly in front of it, which is owned by the town and needs about $250,000 worth of work. However, the inn does come with tourists who don’t necessarily stay at the inn, but who walk across the inn property to get a look at the beacon, which still shines at night. Jeffrey Burke, the inn’s former owner who now chairs the island town’s lighthouse committee, said there is no formal public access to the lighthouse, and the town does not encourage anyone to cross the private property that lies between the town road and where the lighthouse towers above the rocky ledge at Robinson Point. The lighthouse is connected to the inn by a wooden walkway. 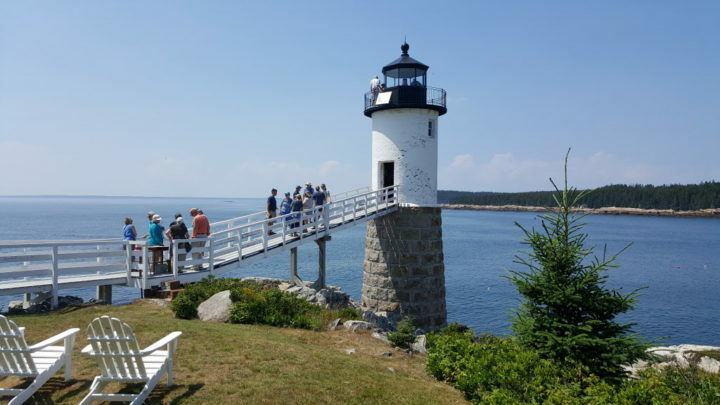 But, he acknowledged, it is a fact of life that people — often tourists who make the 6-mile boat trip to Isle Au Haut from Stonington on the mail boat — do walk up to the inn to get a good view of the lighthouse, even if they aren’t inn guests. “They’ve been doing it for 111 years,” Burke said, noting that the lighthouse was built in 1907. It sits at the southern entrance to the Isle Au Haut Thoroughfare, which separates Isle Au Haut from Kimball Island and serves as a protected harbor for the community. Burke and his wife, Judith Burke, purchased and restored the lightkeeper’s house in the 1980s, running it as an inn. He said that they always understood there was a symbiotic relationship between the inn and the lighthouse tower, which the Coast Guard deeded to the town in the late 1990s. The inn’s current owner, Marshall Chapman Jr., understands and respects that relationship as well, he said. The 2-acre inn property is listed for sale by Knowles Company for $1.9 million. It includes a four-bedroom, turn-of-the-century keeper’s house, a guest house, several cottages, a boathouse and a deep-water dock. The property has “incredible views” of Penobscot Bay, other offshore islands to the west and the Camden Hills, according to the real estate firm. 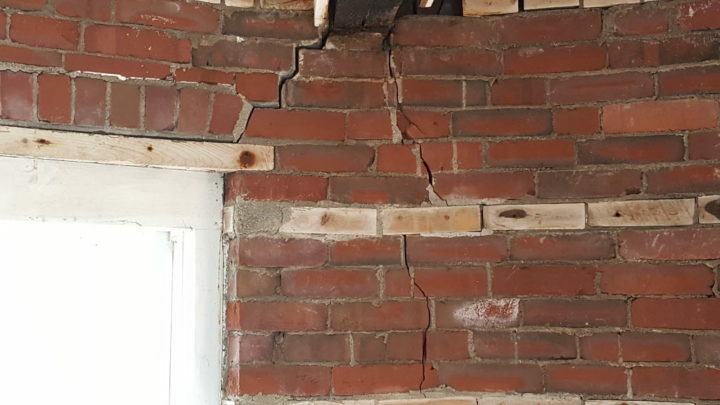 Damaged masonry inside the Isle au Haut lighthouse. A committee of locals and summer residents is raising money to launch a major restoration effort. The lighthouse itself, which is not open to the public, needs work. Burke said the town hopes to go out to bid this fall for the first phase of the lighthouse renovation project, which will include repointing and repairing interior masonry, reinforcing the pedestrian ramp that connects the lighthouse to the inn property, replacing some structural steel, and installing replica doors that used to open up to a fog bell that hung outside the lighthouse facing the thoroughfare. The fog bell, he said, was removed and discarded by the Coast Guard decades ago. The town has raised roughly $150,000 so far for renovations, which Burke said should cover the first phase of work. He said the second phase — which will include exterior masonry repairs, refurbishing the lantern room at the top and acquiring and installing a new fog bell — is expected to cost around $100,000.